received criticism from FCC Chair Ajit Pai. Rep. Ro Khanna has had it in for Federal Communications Commission Chairman Ajit Pai almost from Day One. “He is writing the rules of modern day capitalism in a way that privileges these elite telecom companies, with concentrated economic power, at the expense of low income Americans,” Khanna said earlier this year. 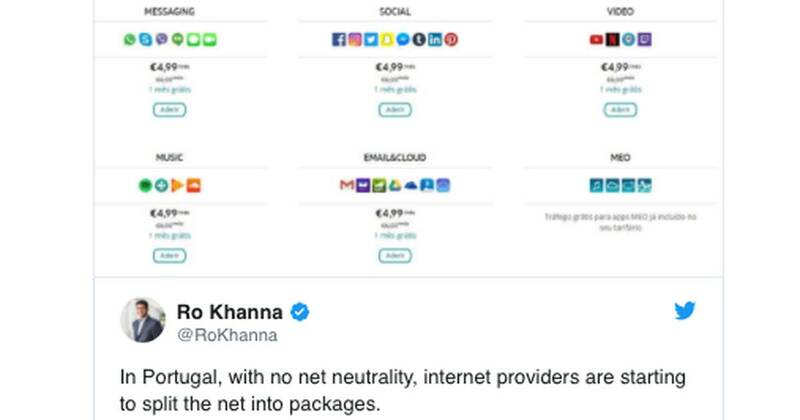 He then made reference to a tweet Khanna posted Aug. 26 on the impact on Web consumers in Portugal in the absence of net neutrality. Khanna’s posting has gone viral since, garnering nearly 65,000 retweets, as of Tuesday night. Pai, however, did not direct his comments specifically toward Khanna, but instead to Star Trek actor George Takei, who retweeted the first-term congressmember. Khanna, nonetheless, lashed back at Pai on Twitter.
.@AjitPaiFCC attacked me today along with @MarkRuffalo & @Alyssa_Milano but got the facts wrong. Application-specific bundles like the Portugal MEO example would almost certainly have been revised by the Wheeler FCC under the 2015 order. Maybe read the order before repealing it? Posted in Ajit Pai, appointment, CA17, congress, internet, net neutrality, Portugal, Ro Khanna, tweet, Twitter. Bookmark the permalink. This is a return to a policy that was in place during the Clinton administration, the Bush administration and Obama's first term. Why, all of a sudden, is this a major problem?